Previous Structure: Three span, 3 x 6.1 m treated timber bridge on treated timber substructure. New Structure: Three span, 10 m – 12 m – 10 m type SL-510 standard bridge on a steel substructure. Roseke Engineering Ltd. was engaged by Lethbridge County to perform this bridge replacement project. The bridge was nearing the end of its life span with stability issues at both piers. 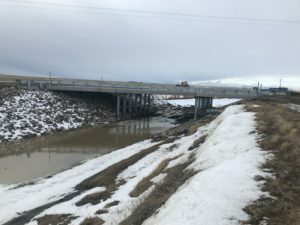 This project required coordination with the Lethbridge Northern Irrigation District, which owned the canal.